Many biological tests were done to study the effect of the crude alcoholic leaves extracts on the biological characteristics at the larvae fruit fly Ceratitis capitata with different concentrations of the extracts exposed 1,2,3,5 and 7.5 % at constant laboratory conditions includes the temperature and the relative humidity (27±2C0&70±5 % respectively). The results of the experiments showed that the alcoholic extracts of the plant effected the growth and the development of the larvae and pupae according to the concentrations . The alcoholic extracts proved to have the highest mortality tend to 66.76 % in larva treated with alcoholic at concentration 7.5 % the result also showed that, there was no signifecant differences on the perid of larva pupation that treated with the different concentration. أُجريت اختبارات حيوية عديدة لدراسة تأثيرتراكيز مختلفة من المستخلص الكحولي الخام لاوراق نبات حلق السبع الشجيري Adhatoda vasica في بعض الجوانب الحياتية لحشرة ذبابة ثمار فاكهة البحر الابيض المتوسط Ceratitis capitata ، اذ عُرض الطور اليرقي الأخير (الثالث) بتراكيز من المستخلص الكحولي وبالتراكيز التابعة 1 ،2،3،5 و 7.5% في ظروف مختبرية ثابتة من درجة الحرارة 2+27م° ، الرطوبة النسبية 70+5% وقد اوضحت النتائج ان المستخلص الكحولي لاوراق هذا النبات ذو تأثير في نمو وتطور اليرقات المعاملة تبعا للتركيز المستعمل . كما اظهرت النتائج ان المستخلص الكحولي كان ذا تأثير في بعض جوانب الآداء الحياتي لذبابة البحر الابيض المتوسط ،اذ اظهَرالمستخلص الكحولي نسبة قتل عالية وصلت الى 66.76 % عند معاملة اليرقات بتركيز 7.5 % . واظهرت النتائج ايضاً عدم وجود فروق معنوية في مدة تعذر اليرقات المعاملة بالتراكيز المقترحة لمعاملة ورق الترشيح لاوراق نبات حلق السبع الشجيري . The effect of crude alcoholic extracted for the Seeds and Leaves of Apium graveolens Var dulce. In the level of some female hormones in albino Mice. Female hormones --- apium graveolens var dulce --- plants hormone female hormone. This study was aimed to use plant tissue culture technique to induce callus formation of Aloe vera on MS. Medium supplied with 10 mg/l NAA and 5 mg/l BA that exhibit the best results even with subculturing. As the method of  1g. dru weight of callus induced from A. vera crown and in vivo crown were extracted then injected in HPLC using the standards of Ascorbic acid (vit. C), Salysilic acid and Nicotenic acid (vit. B5) to compare with the plant extracts. Results showed high potential of increasing some secondary products using the crown callus culture of A. vera as compared with in vivo crown, Ascorbic acid was 1.829 μg/l in in vivo crown and increased to 3.905 μg/l crown callus culture . Salysilic acid raised from 3.54 μg/l in in vivo crown and reached to 25,487μ g/l and the Nicotenic acid was 19.391 mg/l and decreased to 7.438 μg/l.وظفت تقانة زراعة الأنسجة النباتية لأستحثاث الكالس من نبات الصبار Aloe vera أذ أستعمل الوسط الزرعي Murashigue و Skooge (MS.) كامل القوة وأجريت تجربة تداخل فيها الأوكسين Naphthalin acetic acid (NAA) مع السايتوكاينين Benzyle adenine (BA) بتراكيز مختلفة ، وجد ان التوليفة 10 ملغم/لتر من NAA مع 5 ملغم/لتر من BA افضل توليفة لتكوين الكالس واستمر بالنمو بعد إجراء إعادة الزرع لذا أعتمدت هذه التوليفة. أخذ 1 غم وزن جاف لكل من الكالس الذي أستُحث من تاج crown نبات الصبار وتاج نبات الصبار المزروع في الحديقة النباتية. حضر مستخلصا التاج وبأستعمال جهاز HPLC والمحاليل القياسية لبعض المركبات الثانوية التي شملت Ascorbic acid (فيتامين C) و Salysilic acid و Nicotinic acid (فيتامين B5) للمقارنة. أظهرت النتائج زيادة بعض المركبات الثانوية في مزارع الكالس Callus culture لتاج نبات الصبار عنه في مزارع تاج الصبار المزروع حقلياً إذ بلغ تركيز Ascorbic acid في مزارع تاج الصبار المزروع حقلياً 1.829 مايكروغرام/لتر وزاد في مزارع الكالس الى 3.54 ايكروغرام/لتر، و Salysilic acid فقد زاد من 3.45 مايكروغرام/لتر الى 25.487 مايكروغرام /لتر أما المركب الثانوي Nicotinic acid فقد بلغ تركيزه في تاج الصبار المزروع حقلياً 19.391 مايكروغرام /لتر وقل التركيز في مزارع الكالس الى 7.438 مايكروغرام/لتر. Evaluation of cellular immune response in Golden Hamsters experimentally infected with Leishmania donovani comparing with cellular immune response against chicken Red Blood Cells. The Evaluation of the immune response in Golden Hamsters experimentally infected with Leishmania donovani was determined in this study, particularly, the cellular immune response. Follow up has maintained to determine the Delayed Type of Hypersensitivity using skin test both in infected and control lab animals. Chicken red blood cells were used as a parameter to evaluate the immune system; they are dull and have the ability of immunization. Two concentrations of chicken R.B.C were examined to determine which gives the higher titration in Hamsters and those were 1.5 X 109 cell/ml and 3 X 109 cell/ml , the second concentration gave the maximum titration where then used in this work. After sensitization with Chicken R.B.C for both infected and control groups, delayed type of hypersensitivity has been used against Leishmania donovani antigen and 4 days of follow up were adopted and they were (14, 30, 60, 90) day after infection. Results showed that skin test against both antigens ( L.donovani and chicken R.B.C) was significantly higher than normal at the first day of follow up ( day 14) then gradual decreasing were noticed till the last day of follow up (90). This can indicate that the infection with L.donovani activated the immune response at the beginning of infection, then leads to cellular immune suppression against both L.donovani antigen and chicken R.B.C., so that this immunosuppression is not specific. تم تقييم عمل الجهاز المناعي في الهامستر الذهبي المخمج تجريبيا باللشمانيا الاحشائية و ذلك من خلال متابعة تطور عمل الجهاز المناعي و تحديداً المناعة الخلوية باجراء اختبار فرط الحساسية المتأخر للمجموعات المخمجة و مقارنتها بمجموعات السيطرة و قد تم ذلك باعتماد مؤشر لتقييم عمل الجهاز المناعي و هو كريات الدم الحمرللدجاج ، كونها مستضدات خاملة و لها القابلية على التحسس المناعي للحيوانات المستخدمة كونها حاوية على انوية ، اذ تم اختبار تركيزين من كريات الدم الحمر للدجاج ، الاول 1.5 × 109 كرية / مل و الثاني 3 × 109 كرية / مل و وجد أن التركيز الثاني اعطى اعلى تحسس مناعي و الذي اعتمد في هذا البحث ، و بعد اجراء التمنيع لكريات الدم الحمر للدجاج في الهامستر الذهبي و مجموعة السيطرة اجري اختبار فرط الحساسية المتأخر ( بعد جرعة التحدي) للهامستر الذهبي تجاه مستضد اللشمانيا الاحشائية و اعتمدت اربعة اوقات للمتابعة و هي ( 14، 30 ، 60 ، 90 ) يوما بعد الخمج وأظهرت النتائج اعلى معدل في الفرق بين قطر انتفاخ راحتي القدمين بعد اليوم الاول (14) من المتابعة تجاه كل من مستضد اللشمانيا الاحشائية و كريات الدم الحمر للدجاج تلاه هبوط تدريجي في بقية اوقات المتابعة مما يدل على حدوث تنشيط للمناعة الخلوية في بداية الخمج تبعه هبوط في الاستجابة المناعية الخلوية غير متخصص تجاه مستضد اللشمانيا و كريات الدم الحمر للدجاج. This study includes replication and attenuation of foot and mouth disease virus type O which isolated from infected calves. Many passages for the virus in chick-Embryo were established as a substitute method to the tissue culture which is highly caustic in contrast to the chick embryo. The virus passed ten consequent passages which lead to the reduce of the titer of the virus from 106.53 TCID50/ 0.1 ml in cattle testis tissue culture to 103 TCID50/ 0.1 ml. the pathogenecity of attenuated FMD virus were also studied in both chick-embryo and guinea pigs. Using agar gel diffusion test precipitation antibodies was detected in guinea pig serum after 14 and 21 days post exposure to the attenuated virus. The inoculated guinea pig group with the chick-embryo attenuated virus appear resistance to the challenge virus. The result suggested the efficacy of attenuation of foot and mouth disease virus by using chick-embryo system for immunization against this disease on the level of laboratory Animal. تضمن البحث اكثاروتضعيف فايروس الحمى القلاعية النمط المصليO المعزول من أبقار مصابة بمرض الحمى القلاعية من خلال تمريره في أجنة الدجاج بوصفه طريقة بديلة لإكثاره في المزارع الخلوية التي تكون كلفتها الاقتصادية كبيرة مقارنة بأجنة الدجاج. ومن ثم دراسة إمكانية تحضير لقاح حي مضعف أو مقتول من الفايروس المعزول مرر الفايروس في أجنة الدجاج لعشرة تمريرات متتالية مما أدى إلى انخفاض معيار الفايروس الممرر للتمريرة الثالثة في خلايا خصية العجل الذي بلغ TCID50/0.1 ml 106.53إلى TCID50/0.1 ml 103 عند التمريرة العاشرة . كذلك لوحظ عند فتح البيض المحقون بالفايروس وجود تاثيرات مرضية للفايروس على الجنين وعند حقنه في وسادة القدم لخنازير غنيا ادت الى حدوث علامات مرضية سريرية, كما كشفت اضداد الترسيب في مصول الخنازير بعد 14يوما وبعد 21يوما من التعرض في المجموعة المحقونة بالفايروس المضعف وباستخدام اختبار الترسيب المناعي في هلامة الاكار . لذلك فان اختبار التحدي بفايروس التحدي غير المضعف أظهرت المجموعة المعرضة له مقاومتها ، بينمااظهرت مجموعة السيطرة العلامات السريرية للمرض. تشير هذه النتائج إلى نجاح عملية تضعيف فايروس الحمى القلاعية باستخدام نظام أجنة الدواجن على مستوى الحيوانات المختبرية. The study was performed to isolate and identify the Myxococcus fulvus from the one hundred samples of soils of farms. Special growth conditions had been used to support the growth of M.fulvus local isolates and suppressed the growth of other microorganisms like (Drying , High Temperature , High concentration of antibiotics and specific growth media ) M.fulvus isolates had been subjected to the morphological, cultural , biochemical examination for identification , as well as , study the inhibitory activites of cells and filtrates of localized isolates against some pathogenic fungi include (Trichophyton mentagrophytes , Microsporum gypseum , Aspergillus niger and Fusarium oxyporum ) by using three methods :- Cup assay , well diffusion and mixed culture , Results obtaind could be summarized as follows :- 1. (20) out of (100) soil samples , M.fulvus isolated as fruiting bodies depending on baiting technique by bacterial bait. 2. The media casiton – yeast extract agar was suitable for obtaind the best growth of vegetative swarms as pure culture . 3. (8) local isolates were showed inhibitory effect against all of the tested pathogenic fungi . 4. The concentrated filtrates of (3) local isolates were showed highly inhibitory effect than their unconcentrated filtrates against all of the tested pathogenic fungi . اجريت هذه الدراسة لعزل وتشخيص البكتريا الهلامية Myxococcus fulvus من (100) عينة تربة جمعت من الحقول الزراعية المسمدة عضويا واستخدمت ظروف نمو خاصة لتشجيع نموها وتثبيط نمو الاحياء المجهرية الاخرى وشملت هذه الظروف ( التجفيف ،درجات حرارة عالية، تراكيز عالية من المضادات الحياتية ،اوساط نمو خاصة) وأخضعت العزلات للفحوصات المظهرية والزرعية والكيمو حيويه اللازمة لتشخيصها فضلا عن اختبار الفعالية التثبيطية لخلايا ورواشح هذه العزلات تجاه الفطريات الممرضة :- Trichophyton mentagrophytes, Microsporum gypseum,Aspergillus niger,Fusarium oxyporum بثلاثة طرائق : اقراص الاكار والانتشار بالحفر والخلط مع الوسط الزرعي ويمكن تلخيص النتائج التي امكن الحصول عليها كالاتي: 1. تم الحصول على (20) عزلة كجسما ثمريا تعود للنوع M.fulvus باستخدام تقنية الاصطياد بالطعم البكتيري. 2. يعد الوسط الزرعي الكاستون – خلاصة الخميرة الصلب ملائما لتنمية الحشد الخضري للعزلات كمزروع نقي. 3. اظهرت (8) عزلات محلية فقط فعالية تثبيطية تجاه عزلات الاختبار الفطرية في الوسط الصلب. 4. تميزت الرواشح المركزة لـ ( 3) عزلات محلية بفعالية تثبيطية عالية تجاه العزلات الفطرية الممرضة مقارنة بالرواشح الغير مركزة في الوسط السائل . This study were implemented on (60) broiler chick with one day age divided into three equal groups , first one was given basal diet while group two and three given adiet contain 0.01% ,0.02% tryptophan respectively for 7 weeks . The results show that the chicks recevd the tryptophan have asigneficant increasment in hemoglobin concentration, red blood cells count, packed cell volume and increased the level of globuline concentration and lymphocyte % which mean that the addition of tryptophan improve blood picture charactores and the immunity of the broiler chickens and this evident from the good health state and decrease the mortality among birds . أستخدم في تنفيذ هذه الدراسة (60)فرخ لحم بعمر يوم واحد قسمت الى ثلاث مجموعات متساوية واعطيت الاولى عليقة اعتيادية (مجموعة السيطرة ) واعطيت المجموعتان الثانية والثالثة عليقة اعتيادية مضاف اليها 0.01% و0.02%من التربتوفان على التوالي. استمرت التجربة مدة (7)اسابيع. بينت النتائج ان الطيور التي اضيف التربتوفان الى عليقتها اظهرت ارتفاعا معنويا في تركيز الغلوبيولين وفي نسبة الخلايا اللمفية /المتغايرة وكذلك في عدد خلايا الدم الحمر وتركيز خضاب الدم والنسبة المئوية لحجم الخلايا المرصوص . نستدل من هذه النتائج الى ان اضافة التربتوفان الى عليقة فروج اللحم تعمل على تحسين بعض الصفات الدموية لدى الافراخ من خلال زيادة نسبة الخلايا اللمفية والتي تعتبر الخط الدفاعي الاول في الطيور , وكذلك زيادة تركيز الغلوبيولين وهذا واضح من الحالة الصحية الجيدة للطيور وقلة الهلاكات. This study aimed to know the concentration of elements content in dairy products. Nine samples collected from the local market in Baghdad, two samples of milk and seven of yoghurt.The results were followed: The ratio of Aluminum In Aluminum cans That is used for storage milk and industrialize yoghurt is about 95.5% ,this ratio is against  which said that pureness of Aluminum used in Aluminum cans should not be less than 98-99% . and the ratio of Cadmium reached to 0.001% which is also against  which assure that the Aluminum cans should be clean from that element, mean while the concentration of Iron, Copper and Zinc were within the standard level. The highest concentration of Iron was in treatment B2(canon yoghurt)it was 9.95 mg/L while the lowest concentration 4.1 mg/L was in treatment B1 (lab yoghurt). The highest concentration of Copper appeared in treatment B5 it was 4.63 mg/L while the lowest concentration 0.21 mg/L was in treatment B7. The results of this study illustrate that the increase of Zinc in all treatments. The highest level reached to 17.27 mg/L in B3 treatment (Al-washash yoghurt) and 5.18 mg/L as a lowest concentration in B1 treatment (lab yoghurt). The analytic results showed that all of the treatments were cleaned from lead. The highest concentration of Cadmium reached to 0.070 mg/L in B5 treatment (dragh yoghurt) and the lowest concentration reached to 0.023 mg/L was in B4 (Arbeel yoghurt) while treatment B1(lab yoghurt) and B7(kadmiaa yoghurt) were clean from Cadmium concentration when receipt. أجريت هذه الدراسة لمعرفة تركيز العناصر المعدنية الثقيلة في الحليب واللبن الرائب (اليوغرت (yoghurt ، أخذت تسع عينات بواقع عينتين من الحليب وسبع عينات من اللبن الرائب من الأسواق المحلية في مدينة بغداد وتم تقدير العناصر الثقيلة فيها . كما تم تحليل العناصر في اناء الالمنيوم المستخدم في تصنيع وخزن اللبن المختبري.أظهرت النتائج المتحصل عليها انخفاض درجة نقاوة اناءالألمنيوم الى 95.5% وهذا يعد مخالفاً للمواصفة القياسية العراقية التي أكدت على أن لا تقل نسبة نقاوة قدور الألمنيوم عن 98- 99 %، كما بلغت نسبة الكادميوم 0.001% وهذا مخالف أيضاً للمواصفة القياسية العراقية التي أكدت على وجوب خلو قدور الألمنيوم من هذا العنصر في حين كانت تراكيز الحديد والنحاس والخارصين ضمن المواصفات القياسية المذكورة سابقاً. بلغ أعلى تركيز للألمنيوم عند الاستلام 2.15 ملغم/لتر في العينة B4 (لبن اربيل) في حيث كان أقل تركيز 1.13 ملغم/لتر في العينة B2(لبن كانون) . وبلغ أعلى تركيز للحديد عند الاستلام 9.95 ملغم/لتر في العينة B2 (لبن كانون) في حين كان أقل تركيز 4.1 ملغم/لتر في العينة B1 (لبن مختبري) ، وبلغ أعلى تركيز للنحاس عند الاستلام مباشرة في العينة B5 (لبن حي دراغ) اذ بلغ 4.63 ملغم/لتر واقل تركيز في العينة B7(لبن الكاظمية) الذي بلغ 0.21 ملغم/لتر، في حين خلت العينات B6 ,B4 ,B2 من هذا العنصر. بينت نتائج الدراسة ارتفاع تركيز الخارصين لجميع العينات اذ بلغ أعلى تركيز 17.27 ملغم/لتر في العينة B3 (لبن الوشاش) وأقل تركيز 5.18 ملغم/لتر في العينة B1 (لبن مختبري) . وقد أظهرت نتائج التحليل خلو جميع العينات من الرصاص عند الاستلام. أما بالنسبة الى الكادميوم فقد بلغ أعلى تركيز له 0.070 ملغم/لتر في العينة B5 (لبن حي دراغ) واقل تركيز 0.023 ملغم/لتر في العينة B4 (لبن اربيل) في حين خلت العينتين B1 (لبن مختبري) وB7 (لبن الكاظمية) من هذا العنصر. The objective of this research was to investigate the effect of replacing fat(shortening) with different percentages of tahena on the quality properties (physiochemical and sensory ) of shortened cake.The percentages of moisture,protein ,fat and ash of cake increased significantly(p<0.05) as the replacement was increased .The highest increase percentages were 10,48,5,and 90 %,respectivly, at 100% replacement .Carbohydrate,however,decreased by 10%at 100% replacement .these findings may indicate improvement of cake nutritional value.Standing height,as an indicator of cake volume, also increased significantly by 4% at the 50% replacement then it decreased by 4% 100% replacement level. Basic formula (control) has significantly revealed the highest scores in all sensory properties as compared with all replacement formulae except the 25% which was the best among all replacement treatment ,However,all cakes made of different replacement formulae were generally acceptable. هدف البحث تقصي تأثير أستبدال الدهن المقصر بالطحينة بنسب مختلفة في الخواص النوعية الفيزياكيميائية والحسية للكيك المقصر . أزدادت نسب الرطوبة والبروتين والدهن والرماد للكيك معنويأ (0.05>P) نتيجة زيادةالاستبدال وبلغت أعلى قيمة لها عند نسبة أستبدال 100% بنسب زيادة قدرها 10و48 و5 و90% ، على التوالي ، بينما أنخفضت الكربوهيدرات بنسبة بلغت أقصاها 10% عند نسبة الاستبدال 100% ، الامر الذي ربما يشير الى تحسن القيمة الغذائية للكيك . أما حجم الكيك بدلالة أرتفاعه القائم Standing Height فقد أزداد مع زيادة نسب الاستبدال لتبلغ نسبة الزيادة 4% عند نسبة الاستبدال 50% ثم أنخفضت معنويأ لتصل أدنى نسبة أنخفاض 4% أيضا عند نسبة الآستبدال 100% ، وأظهر التقويم الحسي ، حصول الخلطة الاساس ( المقارنة ) على أعلى الدرجات في جميع الخواص الحسية وبصورة معنوية مقارنة بمعاملات الاستبدال بأستثناء نسبة 25% التي كانت الافضل بين نسب الاستبدال وبصورة عامة كان الكيك المصنع مقبولأ لمختلف معاملات الاستبدال. A land magnetic survey was carried out along regional profile, which is located at the north part of the Iraqi western desert. It starts from al –Qaam City (at north) toward Rutba City (at south) with a total length of 238km. The survey was carried out along the paved road between the two cities, About 113 measuring points were done with inter-station distance of 2 km (for 198 km) and 2 to 5km (for 40km). Two proton magnetometers were used in this survey. One of them is used for base station monitoring, which was fixed as of Salah Aldin field (Akkas). Its readings were used for diurnal corrections. All magnetic measurements were corrected for normal and topographic corrections. The readings were reduced to a certain base level. The resulted magnetic anomalies show a good correlation with those of Arial - magnetic survey anomalies conducted by (C.G.G, 1974). This is true for those anomalies with wavelength more than 50km. While the land magnetic survey has shown more small anomalies which may reflect near surface sources. In addition, there is a considerable difference between the magnetic intensity values of both surveys. The downward continuation method was used in this study for detecting the depth of magnetic anomaly source. But before applying this method the total magnetic field was converted to its vertical component using computer program packages. The 2.5 mathematical modeling techniques were used for interpreting magnetic anomaly. Several models were suggested according to the geological and geophysical surface and subsurface data. These models clearly suggest that the tectonic of the studied area may be completely affected by deep faults that could reach the basements or even cut it. These faults resulted in tectonic blocks with relative movements that could happen through the geological time, and they may be responsible for the tectonic features of the western desert. These faults could also responsible for the lateral and vertical variations that are noticed in subsurface rocks of the studied area. The subsurface lateral susceptibility variation between the different blocks could result from the variation in physical parameter of the rocks (like porosity, fracture density…) and there is a possibility that rocks beneath 18km (lower crust) still possess some magnetic properties. تم أجراء مسح مغناطيسي ارضي لمسار إقليمي يقع في الجزء الشمالي من الصحراء الغربية العراقية ويمتد من مدينة القائم شمالا إلى مدينة الرطبة جنوبا وبطول 238 كم ، أجري المسح على الطريق السالك الذي يربط هاتين المدينتين وبواقع 113 نقطة بمسافة بينية قدرها 2 كم للجزء الأول من المسار و 2 إلى 5 كم للجزء الأخير من المسار . استخدم جهاز قياس الشدة المغناطيسية (البروتون ) في هذا المسح واستخدم جهاز قياس الشدة ( البروتون) هو الآخر بوصفه بوصفه محطة أساس وضعت في حقل صلاح الدين ( عكاز ) إذ اعتمدت قراءات هذا الجهاز لأجراء التصحيحات اليومية ، ثم ربطت جميع القراءات الحقلية إلى موقع المحطة الأساسي ومن خلال ثمان محطات وزعت على طول المسار . وتم أجراء التصحيح الاعتيادي والطوبوغرافي لجميع القراءات وإرجاعها إلى مستوى مرجع واحد. تبين نتائج المسح الأرضي المغناطيسي تطابقا واضحا بنتائج المسح المغناطيسي الجوي ( الذي نفذ عام 1974 من C.G.G. ) وذلك فيما يتعلق بالشواذ ذات السعة التي تزيد عن 50كم، في حين أظهرت هذه الدراسة تفاصيل اكثر في الشواذ ذات السعة الصغيرة كما انه يوجد اختلاف في مقدار الشدة المغناطيسية المقاس في كلتا الدراستين، أستخدم في هذه الدراسة أسلوب التحليل النزولي لتحديد عمق صخور المصدر للشواذ وذلك بعد تحويل المركبة الكلية المقاسة حقليا إلى مركبة عمودية وباستخدام برامج حاسوب جاهزة. ثم اعتمد أسلوب النمذجة الرياضية في تفسير الشواذ المغناطيسية إذ اقترحت العديد من الموديلات تحت السطحية اعتمادا على البيانات الجيولوجية والتكتونية لمنطقة الدراسة وتمت مقارنتها مبدئيا بالشواذ الجذبية للمنطقة نفسها. ومن خلال النتائج المستخلصة من الدراسة اتضح بان عملية النمذجة الرياضية للشواذ المغناطيسية الأرضية تقترح أن تكتونية المنطقة متأثرة بشكل كبير بصدوع عميقة تصل إلى صخور القاعدة أو اعمق وعملت هذه الصدوع على خلق بلوكات توجد بينها حركات نسبية قد تكون هذه الحركات التكتونية التي نمت خلال العصور الجيولوجية السابقة هي المسؤولة عن تكتونية منطقة الصحراء الغربية، مما جعل صخور القشرة العليا تمتاز بصخارية غير متجانسة أفقيا وعموديا (من مفرق عكاشات إلى أ م أرضمة) .كما بينت الدراسة بان الاختلاف في الحساسية المغناطيسية للبلوكات المقترحة قد لا يعود إلى التباين في الصخارية وانما إلى الصفات الفيزياوية، هنالك احتمالا بوجود مغنطة ضعيفة لصخور باطن الأرض بعمق يزيد عن 18 كم أي لصخور القشرة السفلى. Iraqi bentonite is used as main material for preparing ceramic samples with the additions of alumina and magnesia. X-ray diffractions analyses were carried out for the raw material at room temperature. The sequence of mineral phase's transformations of the bentonite for temperatures 1000 ,1100 ,1200 and 1250 ºC reflects that it finally transformed in to mullite 39.18% and cristobalite 62.82%. Samples of different weight constituent were prepared. The effect of its constitutional change reveals through its heat treatments at 1000,1100,1200,1250and 1300ºC .The samples of additions less than 15% of alumina and magnesia could not stand up to 1300ºC while the samples of addition more than 15% are stable .That is shown by analyzing of X-ray diffraction pattern after heat treatments of the samples. The growth of mineralogical phases like cordierite, anorthite ,mullite, cristobalite wollastonite with highest percentage ratio of anorthite 87.53%,cordirite77.35% and wallostonite 62.35% .So the presence refractory materials in the obtained samples highly support the possibility of using the bentonite with additions in the ceramics industry for high temperatures.أستعمل البنتونايت العراقي أساساً لنماذج سيراميكية مع أضافات من الألومينا والمغيسيا .تم تحليل حيود الشعاع السيني للمواد الأولية في درجة حرارة الغرفة من متابعة التغيرات الطورية المعدنية للبنتونايت مع درجات الحرارة الى 1000 و 1100و 1200 و 1250مئوي , وجد بأنها تشير الى تحوله الى المولايت بنسبة 39.18% وكرستوبولات60.82 %. .حضرت النماذج السيراميكية بنسب وزنية مختلفة و ظهر تأثير ذلك عند معاملتها حراريا الى 1000 و 1100و 1200 و 1300درجة مئوية.اذ لم تصمد بعض النماذج ذوات نسب الاضافات الاقل من 15% لكل من الألومينا والمغيسيا اما النماذج التي استقرت فكانت لنسب الأضافات الاكثر من15%. وانعكس ذلك على تحليل حيود الشعاع السيني لها اذ اثبت تبلور أطوار الكورديرايت ,الأنورثايت، المولايت ،الكرستوبولايت والولستونايت. ظهر الأنورثايت بوصفه اعلى نسبة 87.53% والكورديرات77.35 % والولستونايت62.55 % .أن ظهور المعادن الحرارية في النماذج يؤكد ويدعم أمكانية استعمال البنتونايت مع تلك الأضافات في الصناعات السيراميكية للحرارة العالية . In this article we study the variance estimator for the normal distribution when the mean is un known depend of the cumulative function between unbiased estimator and Bays estimator for the variance of normal distribution which is used include Double Stage Shrunken estimator to obtain higher efficiency for the variance estimator of normal distribution when the mean is unknown by using small volume equal volume of two sample .في هذا البحث تمت دراسة مقدر لتباين التوزيع الطبيعي عندما يكون متوسط التوزيع غير معلوم بالاعتماد على دالة تجميعية ما بين المقدر غير المتحيز والمقدر البيزي لتباين التوزيع الطبيعي التي سيتم استخدامها ضمن صيغة المقدر المقلص بمرحلتين للحصول على مقدر لتباين التوزيع الطبيعي عندما يكون متوسط التوزيع غير معلوم وذو كفاءة عالية ، عند استخدامنا لحجوم صغيرة ومتساوية للعينتين المسحوبتين . Fifty one patients with serologically confirmed brucellosis and 70 healthy controls were phenotyped for HLA-A, -B, -DR and -DQ antigens by using standard microlympho-cytotoxicity method, and lymphocytes defined by their CD markers (CD3, CD4, CD8 and CD19). The results revealed a significant (Pc = 0.001) increased frequency of HLA-DR8 (41.18 vs. 10.0%) in the patients . A significant increased percentage of CD8+ lymphocytes was also increased in the patients (25.15 vs. 22.0%; P = 0.006), while CD3+ lymphocytes were significantly decreased (75.1 vs. 79.4%; P = 0.02).نمط مظهريا احدى وخمسون مريضا من مرضى داء البروسيلا المشخصين مصليا وسبعين من الأصحاء لمستضدات خلايا الدم البيض البشرية A و B و DR و DQ باستخدام الطريقة القياسيةMicrolymphocytotoxicity test ، وفضلا عن توصيف الخلايا اللمفية في ضوء بعض الواسمات (CD3 و CD4 و CD8 و CD19). أوضحت النتائج زيادة معنوية(الاحتمالية المصححة = 0.001) بتكرار المستضد HLA-DR8 (41.18 مقابل 10.0%) في المرضى. كما ارتفعت في المرضى ايضا وبفرق معنوي النسبة المئوية للخلايا اللمفية الحاملة للواسم CD8 (25.15 مقابل 22.0%؛ الاحتمالية = 0.006)، في حين انخفضت معنويا الخلايا الحاملة للواسم CD3 (75.1 مقابل 79.4%؛ الاحتمالية = 0.02). The plant Zizyphus spina-christa grows wildly in the middle and southern of Iraq locally named Nabag. In this study the antibacterial activity of several different plant extract (alcoholic hot and cold extract 80%, aqueous hot and cold extract) was tested against some gram negative bacteria that related to Enterobacteriacea as follow; Pseudomonas aeruginosa, Escherchia coli Proteus mirabilis, Serratia mercesence,. Aeromonas sp, Klebsiella pneumoniae ,Shigella sp, Salmonella enteritidis (134), S. typhi(97), S. typhimurium (300) , S. typhi, . The results showed that efficient method of extract was alcoholic hot extract from other extract methods that are used in this study. The detection of active compound in crude extracts of the leaves showed positive reaction for alkaloids, flavonoides, saponin, peptides, tannins and carbohydrates , while the aqueous hot and cold extract did not give any reaction against terpenes ,resins and coumarins . Minimum inhibitory concentration (MIC) of the ethanolic hot extracts of plants was determined and the results showed that MIC of S.typhi was 25 mg / ml and 250 mg/ml aganist Klebsiella pneumoniae Serratia mercesence , Pseudomonas aeruginosa , while other isolates showed variety in their inhibitory action. the ethanolic hot extracts of plants did not show any bacteriocidal effect against all bacteria that included in this study within concentration that used except S. typhi in concentration 50 mg/ml . The effect of Sub – MIC of the ethanolic hot extract of plant on the production of some virulence factors from selective isolates S. typhi ,showed an inhibitory effect on production of H2S but no effect on others characteristic such, mannitol and glucose fermenter at 20 mg / ml . The electrophoresis of plasmid DNA isolated from bacterial cell treated with, alcoholic hot extract at sub-MIC concentrations had a curing effect on the plasmid of S. typhi .Using infrared spectroscopy spectrum indicates the possible effect of alcoholic hot extract on the conformation of the DNA molecules affecting some of its biological functions. ينمو نبات السدر Zizyphus spina-christa بشكل واسع في جنوب ووسط العراق والذي يعرف محلياً النبق او النبك Nabag . في هذه الدراسة اختبرت الفعالية ضد البكترية لمستخلصات مختلفة لاوراق هذا النبات والتي شملت (الاستخلاص بالكحول الحار والبارد 80% ، ,الاستخلاص المائي الحار و البارد) ضد العزلات البكتيرية السالبة لصبغة كرام التي تعود للعائلة المعوية والتي شملت Pseudomonas aeruginosaو Escherchia coli و,mercesence Serratia. و. Aeromonas sp و KlebsielLa pneumoniae , Shigella sp و S. entritidis (134), Salmonella typhi(97), Salmonella. Typhimurium (300), S. typhi..و Proteus mirabilis. وأظهرت النتائج كفاءة طريقة الاستخلاص بالكحول الحار لأوراق نبات السدر عن باقي طرق الاستخلاص المستخدمة تم في هذه الدراسة التحري عن محتوى المركبات الفعالة للمستخلصات المختلفة لاوراق نبات السدر وقد لوحظ من الكشوف النوعية للاوراق احتوائها على الفينولات والتانينات والقلويدات والفلافونات والببتيدات والكاربوهيدرات والصابونيات, في حين لم يظهر كل من المستخلص المائي الحار والمستخلص المائي البارد اختبارا ايجابيا تجاه الراتنجات والتربينات والكومارينات . وشملت الدراسة أيضاً تحديد التركيز المثبط الادنى والقاتل للمستخلص الكحولي الحار لاوراق نبات السدرتجاه جميع عزلات بكتريا الاختبار, اذ بلغ التركيز المثبط الادنى 25 ملغم/مل تجاه العزلة البكترية S. typhi في حين بلغ اعلى تركيز مثبط ادنى 250 ملغم/ مل تجاه العزلاتKlebsiella pneumonia و mercesence Serratia .وPseudomonas aeruginosa في حين تباينت قابلية باقي العزلات في تثبيطها. ولم يبدي المستخلص الكحولي الحار لاوراق هذا النبات تاثير قاتل ضد جميع العزلات البكترية المشمولة في هذه الدراسة ضمن التراكيز المستخدمة باستثناء بكتريا S. typhi عند تركيز 50 ملغم/ مل .كما درس تاثير المستخلص الكحولي الحار في التركيز تحت التركيز المثبط الادنى (20) ملغم تجاه بعض عوامل الضراوة لبكتريا . S. typhi. وكان مثبطاً لاانتاج الـ H2S ولم يكن له تأثير في تخمير المانتول والكلكوز, كما اظهر تاثيرا محيد لبلازميد بكتريا S.typhi.. وعند تحليل الدنا باستخدام الاشعة تحت الحمراء وجد ان المستخلص الكحولي الحار عند التركيزاعلاه قد احدثا تغييراً في الوضعية العامة لجزيئة الـ DNA من ناحية التركيب الثانوي وبالتالي على بعض ادواره الوظيفية الحيوية. Many experiments were achieved to determine the allelopathic potential of the plant Myrtle parts in which it may affects other plants, like: volatile substances which released from the Myrtle leaves , and its effect examined on the germination (GE) and growth (GR) of the selected crops ; Chickpea ( C ) , Wheat(W) , and Lentil (L)., the aqueous extract of the leaf and the root of the plant examined to test its effect on the (GE) and (GR) of the selected crops ; (C) , (W) , and (L)., also plant residue of (M) and its effect tested on the (GE) and (GR) of the selected crops ; ( C ) , (W) , and (L) . Experiments proceeded on Spring 2007 in the greenhouse conditions , and main results which found were that; the effect of the volatile substances released from the Myrtle plant was so great and reached significant levels in all cases and with all tested crops .Whereas, the effect of the other pathways were only in an obvious states and only in the following cases reached a significant levels which were; - the case of the effect of the plant residue on the(GR) of root , shoot , and seedlings of the selected crops ; ( C ),(W) ,and ( L) .-the case of the effect of the plant residue on the (GR) of (W) seeds. 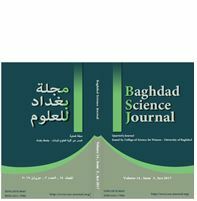 The case of the effect of the aqueous extract of the root of the Myrtle plant on the (GE) of the (C ) seeds β- And finally, the case of the effect of the aqueous extract of the root on the (GR) of the root, shoot, and the seedlings of (L).اجريت عدة تجارب لتحديد الجهد الاليلوباثي لنبات الياس التي تؤثر بها على انبات بذور ونمو بادرات المحاصيل المختبرة (الحمص والعدس والحنطة), وبمسالكها المختلفة مثل مسلك المواد المتطايرة من اوراق الياس ودراسة تأثيراتها على نمو وانبات المحاصيل المختبرة.وكذلك دراسة مسلك المستخلصات المائية (الجذرية والخضرية) .للنبات وتأثيراتها على انبات و نمو المحاصيل المختبرة .واخيرا ,دراسة تأثير المخلفات النباتية للياس وملاحظة تأثيراتها على النباتات المختبرة ,وانجز البحث في ظروف البيت الزجاجي في ربيع 2007 و اهم نتائج البحث هي تأثيرات المواد المتطايرة والتي كانت جوهرية على انبات ونمو النباتات المختبرة كافة, وكذلك تاثيرات المسالك الاخرى كانت ملحوظة عدى ,حالة المخلفات النباتية على نمو الجذور والسيقان للحمص والحنطة وفي حالة المستخلصات المائية لجذور الياس على انبات الحمص وأخيرا ,في حالة المستخلصات المائية للجذور على نمو الجذور والمجموعة الخضرية لمحصول العدس فقط. والتي في هذه الحالات فقط وصلت الى حدود التأثيرات الجوهرية . C-Reactive Protein and Cholesterol level In Male Type 2 Diabetic Patients. Elevated C-Reactive Protein (CRP) level in serum is a risk factor for type 2 diabetes ,this relationship is likely to be the cause it means elevated CRP leads to T2D in future . Our objective was to examine CRP in male Type 2 Diabetes(T2D) patients in different age ,we studied 120 male subjects divided to two groups according to their age. First group A age (31 - 40) year old ,60 person )30 control & 30 T2D patients(,3 person for each same age: second group B age (41 – 50) years old ,60 person )30 control & 30 T2D patients(,3 person for each same age. We examined blood sugar ,cholesterol and CRP in each group. and we toke the mean of samples in the same age in each data in all the 4 groups. Our data shows that CRP raised significantly P≤0.05 in group A(T2D) and in group B(T2D) comparing with control group of each .And cholesterol levels, and sugar levels raised significantly P≤0.05 in group A(T2D) and in group B(T2D) comparing with control group of each. CRP ,Cholesterol and sugar are higher in group B(T2D) than in group A(T2D),and in group B (control) than in group A (control). CRP level can predict diabetes but not causal, diabetes may cause a kind of inflammation (showed by high CRP) by its effect on body and this effect (inflammation) may cause rising CRP level. ارتفاع مستوى C-Reactive Protein (CRP)هو احد العوامل التي ترافق مرضى السكري نوع 2 ٫هذا الترابط بين مستوى CRP ومرض السكري نوع 2 يمكن أن يفسر كعلاقة سببية أي أن ارتفاع CRP يؤدي بالنهاية إلى الإصابة بمرض السكري نوع 2 مع الأخذ بالاعتبار الاختلافات الجينية وأسلوب المعيشة اللذان يؤثران على مستوى CRPهذه تؤدي مجتمعة إلى أعراض مرض السكري .كان الهدف من الدراسة تقييم مستوى CRPوالكولسترول في دم المرضى الذكور المصابين بداء السكري نوع2 ٫تمت هذه الدراسة على 120 ذكر قسموا على مجموعتين عمريتين الأولى مجموعة A (60 شخص) من عمر (31-40 )سنة وتشمل سيطرة 30 شخص غير مصابين ,3 أشخاص لكل عمر (3 تكرارات) ومجموعة مصابين Type 2 Diabetes (T2D) عدد 30 شخص ,3 أشخاص لكل عمر (3 تكرارات):ومجموعة ثانية مجموعة B من عمر (41 -50)سنة وتشمل أيضا مجموعة سيطرة غير مصابين 30 شخص بواقع 3 أشخاص لكل عمر (3 تكرارات) ,ومجموعة مصابين من 30 شخص بواقع 3 أشخاص لكل عمر (3 تكرارات). أعطت النتائج ارتفاع معنويا P≤0.05 بمستوى CRP في مرضى السكري نوع 2 في مجموعةِA ومجموعة B بالمقارنة مع مجموعة السيطرة لكلا المجموعتين وكان هذا الارتفاع موازيا للارتفاع المعنوي P≤0.05 بمستوى سكر الدم والكولسترول في كلا المجموعتين Aو B المصابتين (T2D) بالمقارنة مع مجموعة السيطرة لكلا المجموعتين . إن مستوى CRP في الدم يمكن إن يعتبر كمؤشر لحدوث مرض السكري نوع 2 كما إن ارتفاع CRP لا يسبب مرض السكري نوع 2 وهذا يوضح من خلال, إن مرض السكري نوع 2 يشبه من حيث طبيعة تأثيره على الجسم تأثير الالتهاب إي يعتبر كنوع من أنواع الالتهاب وهذا الأخير يسبب ارتفاع مستوى CRP في هؤلاء المرضى كما وان حدة المرض ومستوى السكر في الدم وCRP والكولسترول يزداد مع تقدم العمر. C-Reactive Protein --- Cholesterol --- T2D --- Inflamation --- IL. Laurylamine hydrochloride CH3(CH2)11 NH3 – Cl has been chosen from cationic surfactants to produce secondary oil using lab. model shown in fig. (1). The relationship between interfacial tension and (temperature, salinity and solution concentration) have been studied as shown in fig. (2, 3, 4) respectively. The optimum values of these three variables are taken (those values that give the lowest interfacial tension). Saturation, permeability and porosity are measured in the lab. The primary oil recovery was displaced by water injection until no more oil can be obtained, then laurylamine chloride is injected as a secondary oil recovery. The total oil recovery is 96.6% or 88.8% of the residual oil has been recovered by this technique as shown in fig. (5). This method was applied in an oil field and it gave approximate values close to that obtained in the lab.لقد تم اختيار كلوريد أمين لوريل من المحاليل فعالة السطح سالبة الشحنة (cationic) لاستخراج النفط الثانوي باستخدام موديل مختبري كما مبين في الشكل (1). درست العلاقة بين الشد البيني و(درجة الحرارة، الملوحة، وتركيز المحلول) كما مبين في الأشكال (2، 3، 4) على التوالي. أخذت أقصى القيم لهذه المتغيرات الثلاثة (تلك القيم التي تعطي أقل شد بيني). لقد تم قياس التشبع والنفاذية والمسامية في المختبر. لقد تمت الإزاحة الأولية للنفط عن طريق حقن الماء إلى أن توقف إنتاج النفط. وبعد ذلك تم حقن محلول كلوريد أمين لوريل إن إنتاج النفط الكلي هو 96.6% أو 88.8% من النفط المتبقي بهذه التقنية كما مبين في الشكل (5). تم تطبيق في حقل نفطي فأعطت نتائج مقاربة للنموذج المختبري. surfactants --- optimum concentration --- optimum salinity --- optimum temperature --- oil recovery --- Lab. Model --- injection process. Produced water is accompanied with the production of oil and gas especially at the fields producing by water drive or water injection. The quantity of these waters is expected to be more complicated problem with an increasing in water cut which is expected to be 3-8 barrels water/produced barrel oil. Produced water may contain many constituents based on what is present in the subsurface at a particular location. Produced water contains dissolved solids and hydrocarbons (dissolved and suspended) and oxygen depletion. The most common dissolved solid is salt with concentrations range between a few parts per thousand to hundreds parts per thousand. In addition to salt, many produced waters also contain high levels of heavy metals like zinc, barium, chromium, lead, nickel, uranium, vanadium and low levels of naturally occurring radioactive materials (NORM). This study will highlight the main aspects of the different international experiences with the produced water treatment for subsequent reuse or disposal. These different treatment methods vary considerably in effectiveness, cost and their environmental impacts. Samples of produced water from Al-Mishrif formation in ten wells belongs to five fields southern Iraq were taken and analyzed chemically to define the basic features of these waters and to have guide lines for the best strategy that required handling the increased water cut in these fields. ان الماء المنتج يصاحب انتاج النفط والغاز خصوصا في الحقول التي تنتج بالدفع المائي او بالحقن المائي.ان كمية هذه المياه من المتوقع ان تصبح مشكله اكثر تعقيدا مع زيادة القطع المائي الذي من المتوقع ان يصبح 3-8برميل ماء لكل برميل نفط منتج. يحتوي الماء المنتج على العديد من المكونات اعتمادا على ماموجود تحت السطح في موقع معين.ان الماء المنتج يحتوي على مواد صلبه مذابه وهايدروكاربونات(مذابه وعالقه) واوكسجين ناضب.الملح هو اكثر ماده صلبه مذابه بتراكيز تتراوح من عدة اجزاء لكل الف الى مئات الاجزاء لكل الف.اضافة الى الملح فان العديد من المياه المنتجه تحوي ايضا مستويات عاليه من العناصر الثقيله كالزنك والباريوم والكروميوم والرصاص والنيكل واليورانيوم والفانديوم ومستويات قليله من العناصر المشعه المتواجده طبيعيا. تلقي هذه الدراسه الضوء على المفاهيم الرئيسيه لمختلف التجارب العالميه المتعلقه بمعالجة الماء المنتج لاغراض اعادة الاستخدام المتعاقب او التخلص.تتباين طرق المعالجه هذه بكفائتها وكلفتها وتاثيراتها البيئيه. تم اخذ نماذج من الماء المنتج من تكوين المشرف في عشرة ابار تعود لحقلين نفطيين جنوب العراق وتم تحليلها كيميائيا لمعرفة السمات الرئيسيه لهذه المياه من اجل وضع الخطط لافضل استراتيجيه مطلوبه للتعامل مع زيادة القطع المائي في هذه الحقول. Evaporation is one of the major components of the hydrological cycle in the nature, thus its accurate estimation is so important in the planning and management of the irrigation practices and to assess water availability and requirements. The aim of this study is to investigate the ability of fuzzy inference system for estimating monthly pan evaporation form meteorological data. The study has been carried out depending on 261 monthly measurements of each of temperature (T), relative humidity (RH), and wind speed (W) which have been available in Emara meteorological station, southern Iraq. Three different fuzzy models comprising various combinations of monthly climatic variables (temperature, wind speed, and relative humidity) were developed to evaluate effect of each of these variables on estimation process. Two error statistics namely root mean squared error and coefficient of determination were used to measure the performance of the developed models. The results indicated that the model, whose input variables are T, W, and RH, perform the best for estimating evaporation values. In addition, the model which is dominated by (T) is significantly and distinctly helps to prove the predictive ability of fuzzy inference system. Furthermore, agreements of the results with the observed measurements indicate that fuzzy logic is adequate intelligent approach for modeling the dynamic of evaporation process.يعد التبخر احد المكونات الرئيسة للدورة الهيدرولوجية في الطبيعة وعليه فان قياس مقدار التبخر ضروري لتقييم المتطلبات المائية فضلاً عن التخطيط لمشاريع الري. ان الهدف من هذه الدراسة هو للتحري عن امكانية تقنية المنطق المضبب للتنبؤ بقيمة التبخر الشهري من المعلومات المناخية الاخرى. اجريت الدراسة اعتماداً على 261 قياساً لكل من معدل درجات الحرارة الشهرية ومعدل سرعة الرياح الشهرية ومعدل الرطوبة النسبية الشهرية والمتوفرة في محطة انواء العمارة الواقعة في جنوب العراق. تم انشاء ثلاث نماذج مضببة باستخدام متغيرات ادخال متنوعة بهدف تقييم تاثير هذه المتغيرات على عملية التنبؤ. استخدم متغييرين احصائيين هما معامل التحديد ومقدار الخطا التربيعي لتقييم ادائية النماذج المطورة. اشارت النتائج بان النموذج الذي تكون متغيرات ادخاله درجة الحرارة والرطوبة النسبية وسرعة الرياح هي الافضل في تخمين قيم التبخر الشهري. فضلاً عن ذلك، فقد برهنت النتائج ايضاً على ان النموذج المضبب الذي يكون متغير ادخاله فقط درجة الحرارة هو الاخر نموذج فاعل في تخمين التبخر. بالاضافة الى ذلك، فان التطابق في القيم المقاسة والمتنبأ بها تؤكد بان المنطق المضبب هو طريقة ملائمة وذكية لنمذجة ديناميكية عملية التبخر. The reliability of optical sources is strongly dependent on the degradation and device characteristics are critically dependent on temperature. The degradation behaviours and reliability test results for the laser diode device (Sony-DL3148-025) will be presented .These devices are usually highly reliable. The degradation behaviour was exhibited in several aging tests, and device lifetimes were then estimated. The temperature dependence of 0.63μm lasers was studied. An aging test with constant light power operation of 5mW was carried out at 10, 25, 50 and 70°C for 100hours. Lifetimes of the optical sources have greatly improved, and these optical sources can be applied to various types of transmission systems. Within this degradation range, the device life for system application is estimated to be more than 100 h at 70 ºC at a constant power of 5mW. إنّ الموثوقيةَ في المصادر الضوئية تعتمد بشكل كبير على التقادم و إنّ خصائص ثنائي الليزر تعتمد بشكل حرج على درجةِ الحرارة. تمت دراسة نَتائِجَ إختبار سلوكيات التقادم و الموثوقية لثنائي الليزر (Sony-DL3148-025), وتبين بأن هذه الليزرات تكون عادة ذات موثوقية عالية, وسلوك التقادم قد تم تعرضه في عِدّة إختبارات عمرية، وتم من خلالها تقدير العمر الزمني لهذه الثنائيات، وأجريت دراسة إعتمادية الليزر دايود ذات الطول الموجي 0.63 مايكروميتر على درجة الحرارة. تم أجراء الاختبار العمري لقدرة ضوئية ثابتة 5 ملي واط عند درجات حرارة مختلفة 10و25و50و70 م° و لمدة 100 ساعة. فقد تم تحسن العمر الزمني لهذه المصادر الضوئية بشكل, ويُمْكِنُ لهذه المصادرِ الضوئية تطبيقها في الأنواعِ المُخْتَلِفةِ مِنْ أنظمةِ الإرسال. وضمن هذا المدى من التقادم فقد تم تقدير العمر الزمني لهذه الليزرات فوجد أنه أكثر من 100 ساعة عند درجة حرارة 70 م° وعند قدرة ثابتة مقدارها 5 ملي واط. A computational investigation has been carried out on the design and properties of the electrostatic mirror. In this research, we suggest a mathematical expression to represent the axial potential of an electrostatic mirror. The electron beam path under zero magnification condition had been investigated as mirror trajectory with the aid of fourth – order – Runge – Kutta method. The spherical and chromatic aberration coefficients of mirror has computed and normalized in terms of the focal length. The choice of the mirror depends on the operational requirements, i.e. each optical element in optical system has suffer from the chromatic aberration, for this case, it is use to operate the mirror in optical system at various values of chromatic aberration to correct it in that system. اجريَ بحث حاسوبي عن تصميم وخواص مرآة كهروسكونية. في هذا البحث، اقترحنا معادلة رياضية تمثل الجهد المحوري لمرآة الكهروسكونية. درس مسار الحزمة الالكترونية تحت شرط التكبير الصفري على انها مسار مرآتي بالاستعانة بطريقة fourth – order – Runge – Kutta. وحسبت معادلات الزيغ الكروي واللوني للمرآة وتم تعييرها بدلالة البعد البؤري. ان اختيار المرآة يعتمد على مستلزمات التشغيل وذلك كل عنصر بصري في اي نظام يعاني من زيغ لوني، في هذه الحالة يمكن تشغيل المرآة في منظومة بصرية عند قيم مختلفة للزيغ اللوني لتصحيحها في ذلك النظام. Electrostatic mirror – mirror aberration. Equilibrium adsorption isotherm for the removal of trifluralin from aqueous solutions using α –alumina clay has been studied. The result shows that the isotherms were S3 according Giels classification. The effects of various experimental parameters such as contact time, adsorbent dosage, effect of pH and temperature of trifluralin on the adsorption capacities have been investigated. The adsorption isotherms were obtained by obeying freundlich adsorption isotherm with (R2 = 0.91249-0.8149). The thermodynamic parameters have been calculated by using the adsorption process at five different temperature, the values of ∆H, ∆G and ∆S were (_1.0625) kj. mol-1, (7.628 - 7.831) kj.mol-1 and (_2.7966 - _2.9162) kg. k-1. mol-1 respectively. The kinetic study of adsorption process has been studied depending on three kinetic equations: 1- Allergen equation 2- Morris –weber eguation 3- Reichenberg eguation. In general, the result shows the isotherm were on α- alumina according to Giels classification. α –alumina and thermodynamic يتضمن موضوع البحث دراسة امتزاز الترفلان لأزالته من المحاليل المائية باستخدام الفا- الومينا. تم الحصول على ايزوثرمات الامتزاز بتطبيق معادلة فرندلش بنسبة خطية ( 0.91249-0.8149) واوضحت النتائج ان الأيزوثيرم من نوع ( (S3وفق لتصنيف كيلز. درس من خلال تجارب مختلفة تأثير زمن الأتزان والدالة الحامضية وكمية المادة الممتزة ودرجة الحرارة لترفلان على سعة الامتزاز. تم حساب القيم الثرمودينامكية بخمس درجات حرارية وكانت انثالبي التفاعل (_1.0625) كيلوجول. مول-1 وقيم الطاقة الحرة لكبس محصورة بين (7.628 - 7.831) كيلوجول. مول-1 وقيم الانتروبي بين (_ -2.7966 (_2.9162 جول.مول-1 على التوالي. تمت دراسة حركيات الامتزاز اعتمادا على ثلاث معادلات حركية هي: 1- معادلة لنكماير 2- معادلة موريس/ ويبر 3- معادلة ريجمبرج . Background :Alkaline phosphatase (ALP) was a widely used marker for skeletal and hepatobiliary disorders, but its activity was also increased in atherosclerosis and peripheral vascular disease. Several study has showed that ALP activity was increased in the sera of diabetic patients. The current study was conducted to evaluate ALP activity in type 2 diabetic patients and optimum conditions for enzyme activity in their sera. Methods: This study was carried out at in AL-Yarmok hospital(diabetic center) between February /2009 and April /2009. Fifty two patients with type 2 diabetes have been enrolled. Besides BMI, WHR, serum fasting blood glucose, ALP, HbA1C,uric acid and lipid profile levels have been performed .The relationship between ALP and other biochemical factors have been studied. Results: From a total 52 cases, FBG, HbA1C and ALP were significantly elevated P value < 0.01 while Uric acid, Cholesterol, TG, HDL, LDL,VLDL and LDL/HDL were significantly different P value < 0.05 in diabetic patients when compared with that found in control group . ALP was significantly associated with LDL (P < 0.05) and significantly negative correlation with HbA1C (P <0.05) in diabetic patients. There was different in pH optimum, Incubation time, Temperature, when determination of them in diabetic patients and control. Conclusions: The current study suggested that the different in ALP kinetic may be referred to another isoenzyme in sera of diabetes patients, and the present study suggested to seperate and characterize of ALP isoenzyme by using electorphoretic purification of enzymes. خلفية البحث: يعتبر الالكلاين فوسفتيز ALP من الانزيمات المستعملة بشكل واسع كمؤشر للاضطرابات الكبدية والعضلات ايظا قد تحصل زيادة في مستواه عند الاصابة بتصلب الشرايين وامراض الاوعية الدموية المحيطة . اشارت الدراسات الى زياده في فعالية انزيم ALP عند المرضى المصابين بالداء بالسكري . تهدف الدراسة الحالية الى قياس فعالية ALP وبعض العوامل الكيميائية الحياتية عند المرضى المصابين بالسكري النوع الثاني فضلا عن دراسة الظروف المثلى لفعالية الإنزيم عند المصابين بالمرض طريقة العمل :اجريت هذه الدراسة بعد اخذ نماذج الدم من مركز الداء السكري في مستشفى اليرموك للفترة من شهر شباط 2009 ولغاية نيسان 2009 ،وقد تم دراسة مستوى سكر الدم الصيامي عند 52 مريض وكذلك تم قياس ALP, HbA1C و Uric acid ومستوى الدهون الكلي إضافة الى حساب BMI,WHR ومقارنتها بمجموعة الضبط المكونة من 27 شخص من الاصحاء وكذلك تم دراسة العلاقة بين الانزيم وبقية العوامل المقاسة في هذه الدراسة . النتائج : لوحظ وجود زيادة مقبولة احصائيا في فعالية ALP فضلا عن HbA1C و Uric acid ونسبة الدهون الكلية. وقد لوحظ حدوث تغير بالظروف المثلى للفعالية الانزيمية عند المصابين عند مقارنتها بالاصحاء. وقد اشارت الدراسة الى وجود علاقة خطية طردية مقبولة احصائيا بين ALP وLDL في حين ارتبط ,ALP, HbA1C بعلاقة خطية عكسية مقبولة احصائيا عند المصابين بالمرض. الاستنتاج : الاختلاف في حركيات انزيم ALP عند المصابين بالداء السكري النوع الثاني ربما تعود الى وجود متناظر اخر للانزيم عند المصابين بالمرض وتقترح الدراسة الحالية الى فصل متناظرات الانزيم عند المصابين بالمرض ودراسة خواص كل متناظر اضافة الى اجراء الترحيل الكهربائي لمتناظرات الانزيم عند المصابين بالمرض. This work includes two steps of synthesis, the first one is the synthesis of indole which was prepared according to literature of the reaction of phenyl hydrazine with acetaldehyde in glacial acetic acid afforded phenyl hydrazone of acetaldehyde , this product was fused with zinc chloride to give the indole.Reaction of cyclohexanone with phenyl hydrazine using the same procedure for the preparing giving 1,2,3,4-Tetrahydrocarbazole. Second step involved synthesis of a series of (17) of mannich bases derivatives of indole and 1,2,3,4-Tetrahydrocarbazle. Mannich reaction involves the condensation of aldehyde usually formaldehyde with different secondary amine and with compound containing an activated hydrogen.The reaction illustrated by the following equation : R2NH+HCHO+RH→R2N-CH2-R+H2O These compounds were characterized by U.V , FT-IR and 1H-NMR spectra for two compounds. The secondary amines that used to prepare mannich bases are: N-methyl –N-phenyl amine, N,N-dimethyl amine, N,N- diphenyl amine, N-ethyl –N- phenyl amine, N,N-di-n-propyl amine, pyrrolidine, morpholine, N- methyl pipyridine, N,N-dibenzyl amine, N,N-di –n-butyl amine and N,N-di ethyl amine. يتضمن البحث خطوتين ، الخطوة الأولى هي تحضير الاندول من تفاعل فنيل هيدرازين مع الاستلديهايد بوجود حامض الخليك وناتج التفاعل هو الهيدرازون للاستلديهايد ثم صهر هذا الناتج مع كلوريد الزنك ليعطي الاندول. أما المشتق الثاني فقد تم تحضيره من تفاعل السايكلوهكسانون مع فنيل هيدرازين باستعمال الطريقة نفسها المذكوره سابقا اعطت مركب 1،2،3،4- تتراهيدروكاربازول . أما الخطوة الثانية فهي تحضير سلسلة من أملاح مانيخ مشتقة من الاندول و1،2،3،4- تتراهيدروكاربازول والتفاعل هو عبارة عن تكثيف الالديهايد (فورمالديهايد) ومشتق الاندول مع أمينات ثانوية مختلفة. تم تشخيص هذه المركبات بالطرائق الطيفية باستخدام طيف الأشعة تحت الحمراء ، طيف الأشعة فوق البنفسجية وطيف الرنين النووي المغناطيسي لاثنين منها. Coupling reaction of 2-amino benzoic acid with 8-hydroxy quinoline gave bidentate azo ligand. The prepared ligand has been identified by Microelemental Analysis,1HNMR,FT-IR and UV-Vis spectroscopic techniques. Treatment of the prepared ligand with the following metal ions (ZnII,CdII and HgII) in aqueous ethanol with a 1:2 M:L ratio and at optimum pH, yielded a series of neutral complexes of the general formula [M(L)2]. The prepared complexes have been characterized by using flame atomic absorption, (C.H.N) Analysis, FT-IR and UV-Vis spectroscopic methods as well as conductivity measurements. The nature of the complexes formed were studied following the mole ratio and continuous variation methods, Beer's law obeyed over a concentration range (1× 10-4- 3 × 10-4 M). High molar absorbtivity of the complex solutions have been observed. The stability constant of the complexes has also been studied. حضرت الليكاند 5-(2- بنزويك اسد ازو)- 8-هيدروكسي كوينولين من تفاعل ازدواج 2- امينو حامض البنزويك مع (8-هيدروكسي كوينولين). شخص الليكاند المحضر بوساطة أطياف الرنين النووي المغناطيسي1HNMR والأشعة تحت الحمراء وفوق البنفسجية- المرئية والتحليل الدقيق للعناصر(C.H.N) . تمت مفاعلة الليكاند مع بعض ألايونات ألفلزية المنتخبه (ZnII,CdII andHgII) في وسط ايثانول - ماء وبنسبة فلز: ليكاند ((2:1 وفي الدالة الحامضية المثلى، وخضعت محاليل هذه المعقدات لقانون لامبرت –بير ضمن مدى التراكيز (1×10-4 - 3×10-4 M) وتم الحصول على سلسلة من المعقدات ذات الصيغة العامة [M(L)2] . شخصت هذه المعقدات باستخدام تقنية الامتصاص الذري اللهبي، أطياف الأشعة تحت الحمراء والأشعة فوق البنفسجية – المرئية والتحليل الدقيق للعناصر(C.H.N) فضلا عن قياسات التوصيلية الكهربائية .درست تراكيب المعقدات باستخدام طريقتي النسب المولية والمتغيرات المستمرة ،كما تم حساب استقرارية المعقدات المحضرة .